I have great news to share as we enter the fall season. 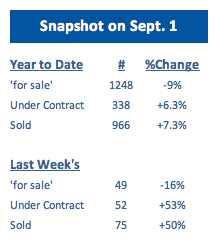 The average sold price is now a positive trend in Breckenridge and throughout Summit County. For this reason, my real estate market update for the month is upbeat overall. However, I do have one word of caution before we dive in. While Summit County as a whole is enjoying higher sold prices, a town-by-town view tells a different story. Approximately half of the towns are experiencing improvement in the average price. But the other half is seeing a decline in the sold prices of homes. I also want to point out that the north side and the south side of Summit County has flipped in terms of sales. Earlier this year, the north end was struggling. Now it’s quite the opposite with a 13.3 percent increase. The south side is encountering some rocky times, though, due to a .8 percent decrease. Interestingly, the north side is having problems with the average sold price. At this time, it has dropped to a negative .6 percent. On the other end of the spectrum, the south side’s average sold price has risen 10 percent. As a whole, Summit County has increased sales by 3.2 percent. You can thank Keystone and Silverthorne for this improvement. Both towns have made an impressive amount of sales with Keystone in the lead. Breckenridge is flat when it comes to sales right now. Of course, the real estate climate can change in an instant. That’s why I’m eager to see how the market evolves as we get closer to the end of the year. Any time you’re preparing to buy or sell a home, the latest reports are always important resources. I tell my clients to check the market on a regular basis so they know what’s happening around them, and of course, overall trends don’t always reflect the situation specific houses or condos will enter into once they are for sale. Just remember that Breckenridge real estate can move in different directions without warning. Therefore, you should be careful not to draw conclusions based on one update. Every market has a rhythm, so get to know the patterns in your area and don’t hesitate to contact me if you’d like to understand your market better. If you’re ready to view homes for sale in Summit County, you can start by browsing the updated listings on my website at any time. When you’re ready to talk through your options or schedule showings, contact me at any time via email ([email protected]) or on my office line. I look forward to working with you!